Shortlisted for the Bord Gais Irish Book Awards Book of the Decade. 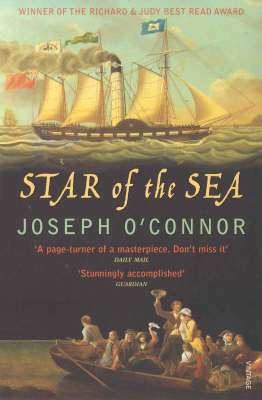 In the bitter winter of 1847, from an Ireland torn by injustice and natural disaster, the Star of the Sea sets sail for New York. On board are hundreds of fleeing refugees. Among them are a maidservant with a devastating secret, bankrupt Lord Meridith and his family, an aspiring novelist, a maker of revolutionary ballads, all braving the Atlantic in search of a new home. Each is connected more deeply than they can possibly know. But a camouflaged killer is stalking the decks, hungry for the vengeance that will bring absolution. The twenty-six day journey will see many lives end, others begin afresh. In a spellbinding story of tragedy and mercy, love and healing, the further the ship sails towards the Promised Land, the more her passengers seem moored to a past which will never let them go.